What is the Right Fade Hairstyle For You? When people hear the words “fade haircut”, they begin to imagine the endless possibilities of how it might look. Some people are unable to tell the difference between a low fade and a high fade, whereas others think that an undercut and a taper fade are the same type of hairstyles. Nonetheless, each guy’s appeal is different and knowing the different types of fade haircuts will save you a lot of disappointment. The classical fade is a hairstyle that usually starts about three to four inches above the hairline. The hair is faded at the same length around the perimeter of the head and each fading level is about ½ inch thick. This type of fade is a great choice to choose from because it’s the hairstyle to go to when you’re lost or stuck. The classical fade is super easy to take care of but requires regular visits to your local barber shop (every 4-6 weeks) for touch ups. When asked to get a low fade, you’re asking for your hair stylist to make your hair disappear about one inch above your natural hairline in the front and in the back. This type of fade hairstyle will stay low as long as it is lower than the classical fade. Depending on the level of your fading line will determine how frequent to come back for a touch-up. The lower the fade, the more frequent you’ll have to come in. The top of a low fade haircut can be styled in many ways, depending on a person’s preference. A taper fade is often called a low fade, however, there are minor differences between the two. This type of fade hairstyle is a little higher than a low fade and the tapering is almost unnoticeable. Taper fades are the most popular hairstyles for men and are complemented by various hair designs at the shaved parts. Like the idea of a mohawk, but want something different? Get the high fade. This type of fade hairstyle stops fading at about two inches from the top part. What does that mean? Most of the hair perimeter will be shaved. A great thing about this hairstyle is that it is very low maintenance. Most people get touch ups every 4-6 weeks, hence, your hair growth speed will determine how often you make an appointment to come in for touch ups. Choose a Fade Hairstyle at Hair MX! Looking for a place to get your fade hairstyle next? Come on over to Hair Mechanix! Our girls do an awesome job of making sure that our customers are pleased. 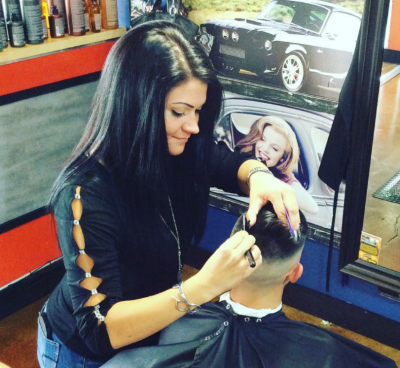 Stop by any one of our locations to get your fade haircut today.